This day is going to be entirely dedicated on knowing Dublin. We have no specific plan for our visits but we know what we want to see. Today we should visit the ones we couldn't see on Friday, as we're leaving tomorrow. We will have the morning for ending our list, though. For this day should be, at least, Trinity College, Dublin's Castle and Guinness storehouse. We’ve rested from yesterday, that’s the reason we’re in the bus stop as late as 10:45 AM and, therefore, we’re walking by Dublin downtown some minutes past eleven. Our thought is going directly to the Trinity College, so we walk College St. up and follow the curve of the Bank of Ireland building until reaching the entrance door to the huge grounds of this college. Once inside we find a continuous passing of young people by a setting with centenarian buildings with classic facades rounding large opened spaces full with the green of the grass. Being that big we don’t know where to drive our first steps to, so we go straight just because a simple logic of following our initial way. We pass under the peculiar tower called Campanile because it once was a bell tower, and go on across a well cared garden composed by some old trees projected from a impeccable carpet of grass. Until we reach the end, which is indeed the end. So we turn round until the Campanile and this time we follow the flux of people and the maps we got at entrance and find out the Old library is at right from the entrance. On our way we can see what seems to be a Greek temple to Goddess of victory Nike, which later would be used by a sports clothes company. Then we arrive to another big area, although smaller than the previous one. The building at our left is full of signs with pictures and the name everywhere of the cultural icon they’ve got here: The book of Kells. A row of people marks, as an X, the spot too. As they don’t let more than 20 persons together in we still must wait for two groups to go in before being our turn. Then, we must pay 8€ for going into a dark exhibit about that specific book and all medieval books in general. This seems to be from year 800 AD. There are signs everywhere reminding photos are forbidden. 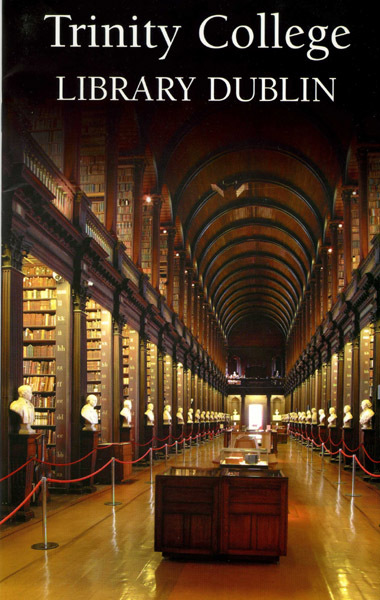 At the end there is a case with some old books, book of Kells among them. Obviously you can only see the shown pages. For some reason this book of Kells attract the interest of the visitor much more than the other books in there and, as it can only be seen from one of the short sides of this rectangle case, the most of the people accumulates there, making difficult for you to see those pages carefully. It is beautiful indeed, as the others books of that period I’ve seen there or in other places. Every single letter was drawn carefully. Then there is the initial uppercase letter, which is always in the middle of a colourful representation. Then we go upstairs where the light come back in the place I was expecting to see because it is the beautiful library I could see on the brochures. We’re in the Old Library where, as description, it’s better a picture. As photos are not allowed, I’ve put at right the front cover of the small book I purchased on the gift store to taking reminds from this place. That is this fabulous place. To the image we can add it really smells to book and the furniture can be seen in the middle of the corridor have more books in display, of different sizes, opened by some sample page. As the most of them are about natural science, this time they’re showing drawings of some plant or animal. These incredible drawings would be in exposition in some museum if they were made over canvas instead of paper. We could find here the authentic harp of Brian Boru, a Celtic harp which has become the emblem of this country, being in the coat of arms and in the logo of the bigger and most important company in Ireland: Guinness. That reminds us we must visit the storehouse today. When we’re back at campus we still explore it a little more until decide to go out. It’s 1:30 PM and we’re going to lunch something fast before getting into Dublin Castle. We choose a small bar with good sandwiches with a supermarket on next door where I get some sweets and fruit as dessert. We can eat by 5€ per person that way. The ones lunched faster went out for a walk and come back telling Molly Malone Statue is just at the end of that same street. We go to the castle, which is in the opposite way, but I know I’m not going to leave Dublin without seeing her. Even with that, we go in and wait in the middle of a big courtyard. We’re crazy for the tour to start, looking more the hot inside than the historical lesson. This place is not normal, I mean, this is a square courtyard and it seems we’re in a castle, but the buildings closing the four sides are all looking as coming from different ages. We can see a façade as the old churches of this city, an arch of stone with wait statues, quite modern buildings in unusual colours as blue or red. For example, the picture below at right shows a wing looking as belonging to a gothic cathedral ends on a medieval castle tower with older stones, joining into a lot younger building of red bricks. When the door gets opened we’re crazy for paying 4.5€ to be let to go inside, running away of the cold out doors. We must wait a little more, though, but now seated on a hot hall. A few minutes later we start the tour around the luxury halls and chambers which, as long as the guide is telling us, they’re still being used for official events. We can see beautiful mural paintings on some rooms and even get a new dose of old books, all along the different rooms on long corridors. I get views of the strange garden of the castle from one of the opened windows. It is a flat circle of grass with some doodle drawn over it. We’ve spent one hour and a half on this visit, with all the waiting, and now we have a clear picture of the next step. We check our maps to choose the best path to the Guinness Storehouse. It’s 3:30 PM now and it is the moment of visiting it. We walk for a half of an hour, no rush, exploring the streets and the churches we’re passing by, as St. Augustine and John’s at picture. When we’re close of it, the buildings look with the same style with their red bricks and, a few minutes later, banners and posters are announcing the proximity of the place qualified as number one attraction by tourists. There are a lot of buildings with the same style around and I guess the production and bottling processes for the most famous black beer in the world happen on them. But only one of them is a tourist attraction. We find the stone door easily and go into a big hall exclusively set as entrance control. There are several rows of people between bars with a lady in uniform at the end selling and delivering the tickets. We split our group on some of the rows for paying 14€ as admission fee and let pass in. Curiously, the young woman attending to us speaks a perfect Spanish and we can be joking with her. Inside, there are six floors of audio-visual exhibition all about every point letting Guinness beer existing: ingredients, the machines, the process,… Some hoe, we spend the most of the time in a specific point of the first floor labelled as “Tasting Lab”. It’s a sort of bar where are continuously delivering short glasses with some of beer with the purpose of people can, as the name tells, taste. But as there is not any repentance control we keep going for glasses and “tasting” them, one after another. Shockingly, the lady on entrance control and speaks Spanish is delivering the glasses now and has no problem about our system for drinking for free. We’re going for our own Guinness record! 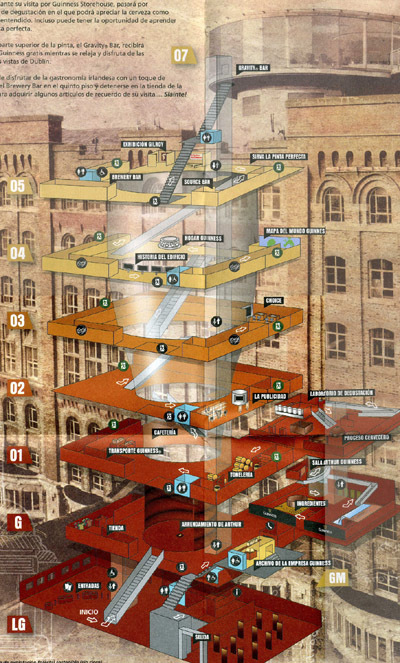 We go along all the floors, which have a big hole in the middle trying to draw the typical Guinness glass in 3D, as you can check in the map below . But the cherry on the icing is, as all cherries, at the top, where a modern platform shaped as a transparent disk has been built in the highest point to get a bar with 360º views of the city. It is really crowded but is beautiful and it has got an extra charm: with our tickets we have the right of be served a paint of Guinness for free, poured in its authentic way by drawing a clover on the froth. When we finish our paint we are “possessed” by the spirit of this beer, so we stop at gift store as first step in our way back to down town, where we get those typical Leprechaun hats. We walk our way along the street wearing our hats. They’re big and there is no way of being unnoticed, but we don’t care at this moment. We stop in some pubs in our way to Temple bar area and find friendly people everywhere. These hats are doing the job and are making people happy. It’s clear it’s not usual to wear such things as we’re the only ones in the whole city doing it, but exists kind of sympathies for them or what they represent which makes us receive salutations from everybody as we walk. 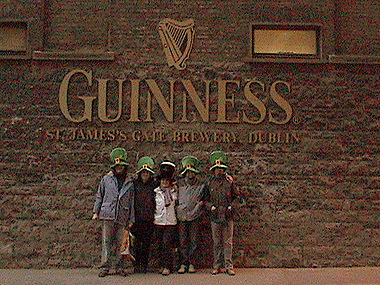 When we’re arriving to the pubs street we agree we’re going to try to go into Temple bar itself wearing the hats. I’m sure they will make us turn around as we weren’t allowed entrance yesterday evening, when we were well dressed, so no way for today. But, surprisingly for me, the magic of these hats works once again and we’re immediately inside the very crowded bar where we seem celebrities because of the people behaviour about us. Honestly, I’ll never will be able to explain what is happening. There is a small opened area at the bottom of the pub as smoking room. Guinness paints are 5.40€ here so, some hours later, we’ve changed to yesterday’s bar, Fitzsimon’s, where paints are 3.60€ and vodka with orange 5.40€. I don’t think we’re going to wake up early tomorrow.